The Hidden Truth considers wide-ranging fields of study to develop a logical path through compelling evidence to discover the nature of reality and the meaning of life. The study begins with a review of the most scientifically sound evidence and moves down a continuum of increasingly esoteric, though still solid, anecdotal evidence. This includes quantum physics, near death experiences, out of body experiences, reincarnation, and hypnosis-type contributions, including inter-life sessions and spirit guide interviews, and finally channeling. The evidence is presented in a convincing fashion, moving in a deliberate step-by-step tempo to show evidential agreement and substantial overlap between these separate fields of study. Dozens of sources are cited from an academic review that included hundreds of books, journals and studies by numerous doctors, scientists and other researchers, and took the author a decade to conclude. 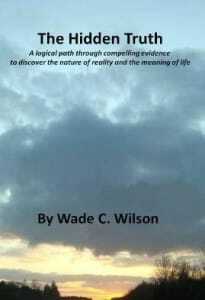 A skeptic himself, Wilson sought to present this overlapping, conclusive evidence in a logical flow so that fellow skeptics might reach the same conclusions as himself concerning the nature of reality and the meaning of life. The Hidden Truth considers wide-ranging fields of study to develop a logical path through compelling evidence to discover the nature of reality and the meaning of life.